Finance and Planning Ministry Secretary Dr P.B. 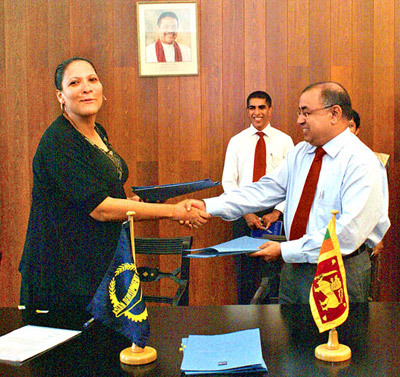 Jayasundera signed on behalf of the government and on behalf of ADB, Portfolio Management Unit Head Candice Medeigan signed two loan agreements at the Finance and Planning Ministry yesterday. The Asian Development Bank (ADB) has agreed to provide financial assistance of US$ 120 million for the implementation of sustainable power sector support project in Sri Lanka in line with the government’s target of providing electricity to all households by end of 2012. The project will contribute to a reliable, adequate and affordable power supply for balanced and sustainable economic growth in Sri Lanka and increase electricity connections in rural areas, specifically in the Eastern, North Central, Southern and Uva Provinces. The total investment cost of the project is US$ 162.03 million (Rs 17,553 million) of which US$ 42.03 million (Rs 4,553 million) will be provided by the government. The total loan from the ADB includes a loan of US$ 10 million (Rs 1,083 million) from the Asian Development Fund (ADF) and a loan of US$ 110 million (Rs 11,917 million) from Ordinary Capital Resources (OCR). Financing of rehabilitation of the micro hydro power plants will be carried out through a credit line. The credit line will be open to estate plantation companies and private sector developers who wish to connect their micro hydro power plants to main grid on the basis of a net metering agreement. The Ceylon Electricity Board (CEB) and Sustainable Energy Authority (SEA), under the Power and Energy Ministry will be the project implementing agencies. The project is scheduled to be completed by April 30, 2014.